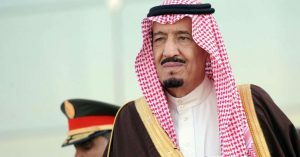 King Salman has ordered the suspension of a journalist for over-praises after he compared the Saudi ruler to God. The 81-years old King Saturday felt uncomfortable after a column in local newspaper al-Jazirah described him as “Haleem”, or forbearing, and “Shadeed al-Eqab”, strict in punishment – both terms associated in Islam with God. The newspaper apologized to the King who reportedly ordered the communication ministry to look into the incident that royal palace described unacceptable. The phrases and tributes, which the author bestowed on the personality of the Custodian of the Two Holy Mosques, are not acceptable, al-Jazirah wrote. Attributing divine qualities or giving individuals any of the 99 names of God is frowned upon in the kingdom, which follows the strict Sunni Muslim Wahhabi school of Islam, Reuters comments. Written by: KanelkaTagba on July 3, 2017. Posted by KanelkaTagba on Jul 3 2017. Filed under Gulf News, Headlines. You can follow any responses to this entry through the RSS 2.0. Both comments and pings are currently closed.